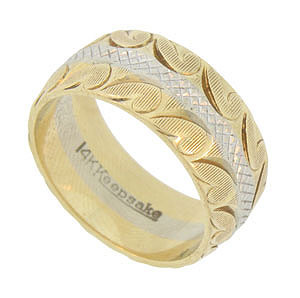 This distinctive 14K bi-color estate wedding band is adorned with golden abstract leaves and white gold latticework. 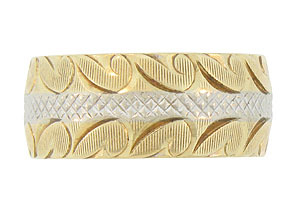 The central white gold band is perfectly blended with the outer yellow gold bands. Intricate engraving reflects the light giving a lustrous sparkle to the rings surface. The wedding ring measures 7.83 mm in width. Circa: 1960. Size 6. We cannot re-size.